Download McDonald’s Canada’s My McD’s app on your Android or iOS mobile phone and you will get a Big Mac, McMuffin or McChicken for only $1! Apparently, this offer is available in Ontario only and for those who login with a new My McD’s app account. This deal is valid until January 14 2017. 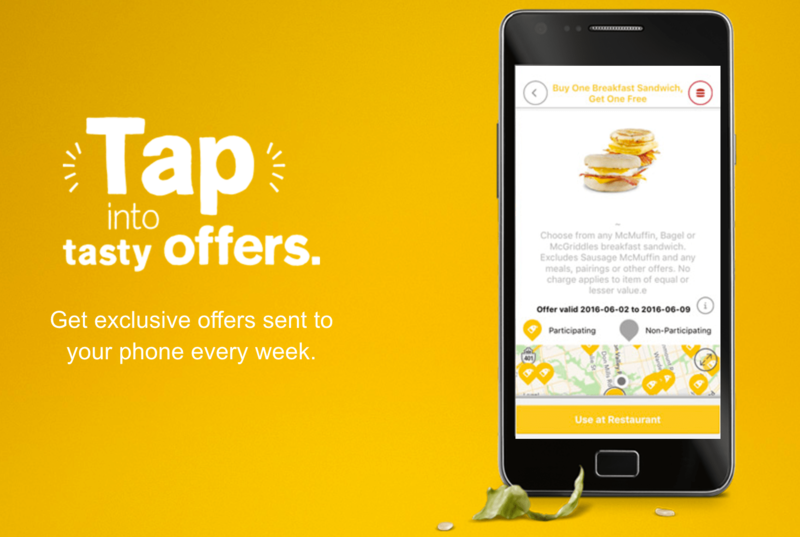 My McD’s app has exclusive offers sent to your phone every week. The offers depend on your region. When you download the app, the offers should appear under the “Your Offers” section. To redeem the offers: Select the offer you want to redeem in your app. When you order at the counter, tell the crew member you have an offer to redeem. They’ll prompt you to hold the barcode displayed on your mobile device in front of the barcode scanner before paying, and the offer will automatically be applied! Alternatively, if you are using the kiosk, select the ‘offers & coupons’ button in the top right of the kiosk screen, select the ‘mobile offer’ button, scan your barcode and add the applicable item to your order. Click here for more information on McDonald’s Canada’s My McD’s application.